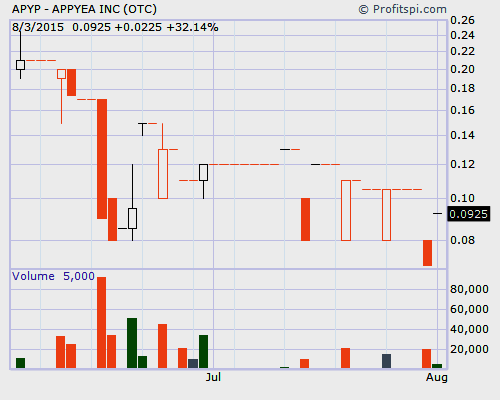 If you’re one of those traders constantly on the lookout for the best penny stocks to buy now, you might want to take a moment and dive into what AppYea, Inc. (OTCQB: APYP) is all about. Having stayed the course in terms of name and share setups since their S-1 was filed in 2013, shares of APYP stock have yet to even break the ice in terms of having a volume session that lands them on scanners across investors’ platforms to make it watch worthy. When though, a couple thousand shares can trade and the PPS can jump up 32%, the games should already begin, especially if you think Star Wars is going to be a blockbuster film this year. To start from the beginning, AppYea filed their S-1 in September, 2013 with the legal assistance of Kenneth Bart, Esq. from Bart and Associates, LLC. Now the linkage system is still relatively fresh in terms of other company setups stemming from Bart, but two, Nexus Enterprise Solutions, Inc. (NXES) and American Brewing Company, Inc. (ABRW), have been flying under the radar thus far, just as how APYP has. AppYea is run by Jackie D. “Dino” Williams, Jr. who just so happened to be the owner of 24,000,000 shares of APYP stock as per the 10-K filing from October, 2014. Having brought on board Castle Rock Resources LLC with 3,300,000 shares, as per the 13-G filed last week, the float for APYP stock should fall in around 12 million or so (based on 36,266,989 issued and outstanding as of May 20, 2015). Why this matters is pretty simple: AppYea is engage in the acquisition, purchase, maintenance and creation of mobile software applications. One of the most popular apps the company provides stems from Disney (DIS), since Disney / Universal Theme Park Wait Time Map Apps is the main app in their portfolio. Others like Katsomoto Games & StreamMe could become a gateway for the Company’s foothold on the $156 billion app industry in due time. For now, what AppYea boasts is a simple balance sheet with little debt (convertible loans outstanding of $132,000), none of which appears to be toxic, and minimal revenues of $2,950 for the nine months ended March 31, 2015. What’s more enticing though, from a possible buy APYP stock point of view, is how shares have been issued over the course of time. The point being… shares of APYP stock were and have historically been issued for $0.75 a shares, yet the current PPS is under $0.10. Does this mean that APYP stock is a no-brainer 5-bagger as it sits currently? Well, the 10-K should be out in October so those who like the Kool-Aid of what’s written in the filings could be breaking through walls if it all works out. Last updated by Timothy Richards at August 4, 2015 .